Kansas City, Mo. — Invicta Fighting Championships today announced the date and location of its next event. Invicta FC 14 will take place Saturday, Sept. 12 from the Municipal Auditorium in Kansas City, Mo. The event will stream live and exclusively on UFC Fight Pass. Headlining the event will be a strawweight title fight between champion Livia Renata Souza (8-0) and challenger Alexa Grasso (7-0). The Brazilian Souza will enter the contest looking to defend her title for the first time. Seven of the 24-year-old’s wins have come via submission, including five in the first round. 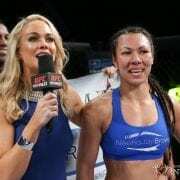 She captured the 115-pound title with a fourth-round finish of Katja Kankaanpää at Invicta FC 12. Like the champion, Mexico’s Grasso has yet to taste defeat in her career. The 21-year-old has earned three straight wins in the Invicta cage, besting Mizuki Inoue, Alida Gray and Ashley Cummins to earn her shot at gold. In the co-main event, Katja Kankaanpää will look to rebound from her title defeat against unbeaten DeAnna Bennett. Also slated for the card is a flyweight contest between Rachael Ostovich and Andrea Lee. Ticket information and additional bouts for Invicta FC 14 will be announced at a later date. An injury to Alexa Grasso has resulted in a new main event for Invicta FC 14. More information can be found here.